If you're on a mission for a casual yet sharp look, pair a Topman jersey turtleneck long sleeve t shirt with black skinny jeans. Both garments are totally comfortable and will look great paired together. Sporting a pair of black leather chelsea boots is a simple way to add extra flair to your look. If you're on the hunt for a casual yet seriously stylish look, opt for a Topman jersey turtleneck long sleeve t shirt and light blue jeans. Both pieces are totally comfortable and will look great together. Rock a pair of beige suede chelsea boots to kick things up to the next level. 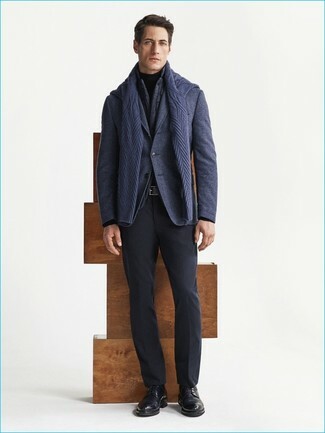 Rock a Topman jersey turtleneck long sleeve t shirt with grey wool dress pants for incredibly stylish attire. Break up your getup with more casual shoes, such as this pair of grey athletic shoes. Opt for a Topman jersey turtleneck long sleeve t shirt and beige wool dress pants for a sharp classy look. Spruce up your outfit with dark brown leather oxford shoes. 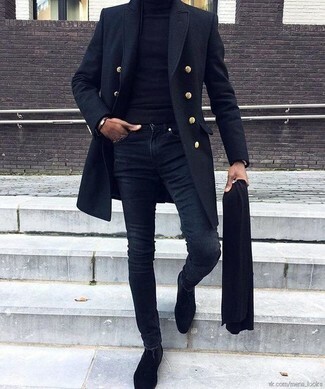 If you're on the hunt for a casual yet dapper look, dress in a black turtleneck and navy skinny jeans. Both garments are totally comfortable and will look great together. To add elegance to your outfit, finish off with black suede chelsea boots. 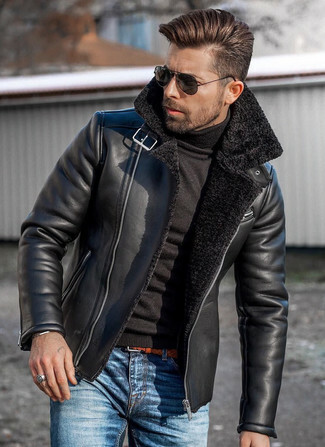 If you're on the lookout for a casual yet seriously stylish outfit, make a Topman jersey turtleneck long sleeve t shirt and blue jeans your outfit choice. Both pieces are totally comfortable and will look great paired together. Choose a Topman jersey turtleneck long sleeve t shirt from Nordstrom and black dress pants to ooze class and sophistication. When it comes to footwear, this ensemble is complemented wonderfully with black leather derby shoes. 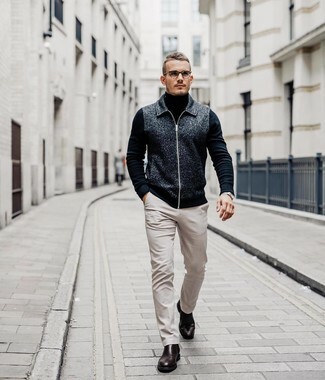 Go for a black turtleneck and beige chinos for relaxed dressing with a fashionable spin. Burgundy leather chelsea boots will create a beautiful contrast against the rest of the outfit. Pair a black turtleneck with khaki dress pants for a classic and refined silhouette. 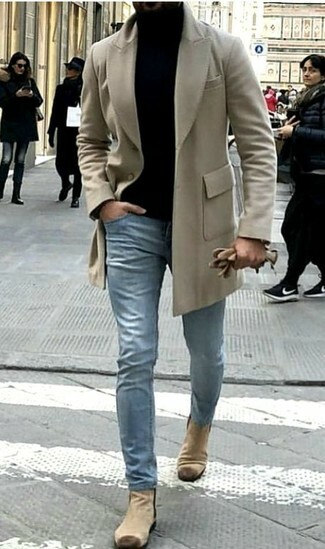 When it comes to footwear, this outfit is round off nicely with black leather derby shoes.